New McCain-Palin web ad: "Strong"
When the financial crisis started, Barack Obama mocked John McCain for saying "the fundamentals of our economy our strong." BARACK OBAMA: "We've got the long term fundamentals that will really make sure this economy grows." Is Obama saying McCain's right? Or is Obama saying his own attacks are shameless? Either way, Obama's a hypocrite. For the first time in their 107 year history, the Chicago White Sox played a tiebreaker game to determine whether they'd move on to the post-season. Although the Sox played poorly in the last week of the season, they came into tonight's win-or-clean-out-your-lockers match-up against the Minnesota Twins on the modest strength of a two-game winning streak. The South Siders prevailed, defeating the Twins 1-0 thanks to pitcher John Danks' masterful performance. In eight innings the lefty gave up just two hits. Morton, Illinois native Jim Thome hit a 461 foot blast of a home run in the seventh inning--and that was all the scoring the White Sox needed. Tonight's game was reminiscent of Game Four of the 2005 World Series. The White Sox defeated the Houston Astros 1-0, scoring the game's only run in the eighth inning. In that match-up, as well as in tonight's tiebreaker, Bobby Jenks earned the save. The Al Central Champions travel to St. Petersburg to face the, yes it's true, mighty Tampa Bay Rays for the first game in their best of five series. I'm excited. So is Chicago, and for the first time in 102 years, both Chicago baseball teams are playing postseason baseball. Back then postseason only meant the World Series, and that year the White Sox topped the Cubs, four games to two. I'm pulling for the Cubs to win their first National League pennant since 1945. And I want them to meet the Sox in the Series again. With the same result as in 1906. John McCain has had a few setbacks during the last few days--and it says something for his character that he plunged himself into the negotiations in getting a financial bailout bill passed. Barack Obama, for his part, has once again, voted "present." John McCain: "I have talked to the President this morning and recommended an increase from $100,000 to $250,000 FDIC insurance on deposits. I also strongly recommended that we use the exchange stability fund that the Treasury has available -- $250 billion -- to shore up these institutions. Also, the Treasury has at its disposal about $1 trillion that they could begin without Congressional authority buying up some of these terrible mortgages and help stabilize the situation. So I've talked to the President. I know that we have to act. Even though we failed yesterday, even though I went back and was able to get more Republicans on board or help get more Republicans on board, we will go back to this, and I will be engaged always where I think America needs engagement." "We're going to have to change enough Republican and Democrats' minds. It was 95 Democrats that voted against it. People's credit is at risk here -- the ability to buy a car, to make your home loan payments, for small businesses to get credit. Look, this is affecting Main Street America. And we're going to have to resolve it, and we're going to have to act. One point two trillion dollars of American savings, pensions, IRAs, mutual funds, investments, et cetera was wiped out, and that hurts Main Street. I've got a plan for cutting spending, for keeping taxes low, for making sure that people can stay in their homes, and a long-term plan. In the short-term, we've got to take these measures I just outlined to you, and let's go back, and let's make Americans understand who are opposed. I was watching your program earlier. How this affects not Wall Street, but Main Street and working families of America." There are a few good things regarding Barack Obama's presidential run. One is the exposure--outside of conservative circles--of Association of Community Organizations for Reform Now (ACORN), as an organization of ill repute. Madeline Talbot, a Chicago ACORN leader, hired Barack Obama to train her staff in the early 1990s. In an early version of the since-failed financial bailout bill, up to $100 million of that money could have gone to an ACORN-tied organization. IN 1992, Barack Obama led a voter registration drive for Project Vote, which also has ties to ACORN. When he served on the boards of The Woods Fund--with Bill Ayers--funds were funnelled to ACORN. Like the Reverend Jeremiah Wright, Tony Rezko, and of course Ayers, ACORN is another association of Obama's that people to the right of Cindy Sheehan may find troubling. ACORN explained that this was an "isolated" incident, yet similar stories have been reported in Missouri, Michigan, Ohio, and Colorado — all swing states, by the way. ACORN members have been prosecuted for voter fraud in a number of states. (See www.rottenacorn.com.) Their philosophy seems to be that everyone deserves the right to vote, whether legal or illegal, living or dead. ACORN recognized very early the opportunity presented by the Community Reinvestment Act (CRA) of 1977. As Stanley Kurtz has reported, ACORN proudly touted "affirmative action" lending and pressured banks to make subprime loans. Madeline Talbott, a Chicago ACORN leader, boasted of "dragging banks kicking and screaming" into dubious loans. And, as Sol Stern reported in City Journal, ACORN also found a remunerative niche as an "advisor" to banks seeking regulatory approval. "Thus we have J.P. Morgan & Co., the legatee of the man who once symbolized for many all that was supposedly evil about American capitalism, suddenly donating hundreds of thousands of dollars to ACORN." Is this a great country or what? As conservative community activist Robert Woodson put it, "The same corporations that pay ransom to Jesse Jackson and Al Sharpton pay ransom to ACORN." ACORN is a discredited organization, and far too many of its leaders and workers have been prosecuted for felonies against democracy. The idea that a single dime of taxpayer money would ever go to such a group is an outrage. And Mr. Obama needs to explain his involvement with them. Hmm....a question for Obama at the next presidential debate? CBS 2 Chicago has a rundown on the speculation that Antoin "Tony" Rezko, the convicted felon who was Barack Obama's first political sponsor, who is apparently talking to federal authorities. Rezko faces another fraud trial next year regarding the sale of his Papa Tony's pizza restaurants. What Rezko knows, and what he is probably talking about, means big problems for Illinois' embattled governor, unpopular Democrat Rod Blagojevich. Prosecutors investigating Gov. Rod Blagojevich's administration would plainly like to hear what Rezko knows, and there is plenty of incentive to talk. One prominent defense attorney told CBS 2 Chief Correspondent Jay Levine, "I've heard 18 different ways that Rezko is talking." Another says Federal Marshals are regularly transporting Rezko from the Metropolitan Correctional Center to the U.S. Attorney's Office. It is, what appears to be, a major about-face for Rezko. Rezko had nothing to say to prosecutors while he was on trial. But all that seems to have changed after six months behind bars in the notorious federal prison in the South Loop. While on trial this spring, Rezko complained that he was forced to wear underwear that other inmates have worn. It was laundered first, right Tony? Presumably the North Shore millionaire has found other unpleasant things while residing at the Metropolitan Correctional Center. Last year, another onetime Blagojevich confidante and fundraiser, Christopher Kelly, was indicted on tax charges unrelated to the Rezko "pay to play" scandals. Blagojevich is trapped in a corner. As for Obama, we may learn soon that his buddy Rezko is a much worse man than we thought. Which will give the Illinois senator the opportunity to expand on his comment, "That's not the Tony I knew," upon learning of Rezko's guilty verdict in June. It was a tense afternoon for me as I watched the stock market fall the Chicago White Sox host the Detroit Tigers for a make-up game. 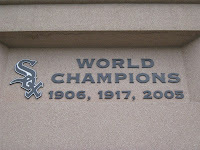 The Minnesota Twins played their 162nd game yesterday, and finished their season a 1/2 game ahead of the South Siders. 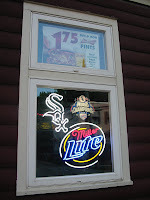 But the Sox won today, 8-2, thanks to a sixth inning grand slam by rookie second baseman Alexi Ramirez. Despite the tension, it was an enjoyable game to watch. Tuesday night the Twins travel to US Cellular Field in Chicago for a one game playoff to determine the AL Central champion. The winner moves on to the American Leage Division Championship Series, and will the Tampa Bay Rays. Fannie Mae and Freddie Mac have always been pet projects of the Democrats. In this video, which comes from a 2004 hearing, shows Democratic congressman after Democratic congressman praising Fannie and Freddie, and Republican after Republican slamming the agency. Two former Fannie Mae CEOs, Jim Johnson and Franklin Raines, have ties to the Barack Obama campaign. If you saw tonight's Hannity & Colmes, you saw just a bit of this piece. Hat tip to Mark W. Johnson of the Illinois GOP Network for the YouTube video. New McCain-Palin ad: "Jim Johnson"